The Hotel Mercedes , 3 stars in Riccione managed directly by the owners, has an air-conditioned swimming pool, a playground area, well-kept rooms, WI-FI and free parking. Admits pets of all sizes. The hotel is located on Riccione's Lungomare Gabriele D'Annunzio, a few steps from the beach, which can be reached by simply crossing the road. It is about 5 minutes walk from the shops of Viale Dante and about 15 from the center and Viale Ceccarini. The rooms are air conditioned and have satellite LCD TV and digital terrestrial, safe, free WI-FI, telephone, independent balcony with front or side sea view equipped with clothesline and bathroom with shower and hairdryer. You can have breakfast in your room. 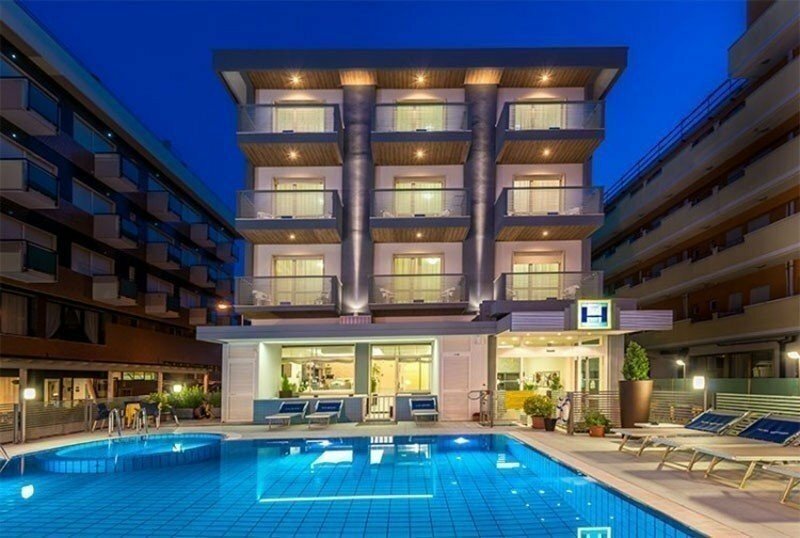 Swimming pool with hydromassage and mini pool for children, garden, sun terrace, playground area, large living room, modern restaurant, reading room, internet point, laundry service (for a fee), lift and free bicycles. PARKING : two free parking lots, one next to the structure, the other not far away, covered, fenced and lit. WI-FI : free throughout the entire structure (at guests' disposal also an internet point). BREAKFAST : buffet with sweet and savory products including biscuits, plum-cakes and hand-made pies by the chef, jams, cereals, assorted croissants, fruit juices and yogurt, as well as cheeses, meats and toasts. LUNCH AND DINNER : the main meals range from traditional dishes from Romagna to international ones. The kitchen offers 3 refined menus of meat and fish every day, with home-made first courses of land and sea. Everything is accompanied by a rich buffet of appetizers, vegetables, salads, croutons, piadina, small pizzas and various snacks. Each meal is concluded by desserts prepared by the chef. VARIATIONS : the buffet is full of proposals also suitable for vegetarians. In hotel : strollers, children's pool (depth 60 cm), outdoor playground area. A baby sitter and pediatrician service is available upon request and for a fee. In the room : cots, baby bath. At meals: baby food , baby menu, seats at the table. On the beach : live entertainment and playground area. The hotel has a garden with an outdoor heated pool with a hydromassage. Around, the equipped solarium area and the terrace. The children have at their disposal a circular area of the pool at a shallow depth (60 cm) to guarantee the game in complete safety. Next to the relaxation area for the older ones, there is also a dedicated playground. The hotel has an agreement with the bathing establishments: Bagni Elio (beach number 116) and Alba D'oro (number 117). Guests have access to the swimming pool, Jacuzzi, cabins, children's play corner, baby sitter and entertainment service, as well as a fitness area for bowls, beach volleyball and table tennis. FAMILY PLAN: 2 adults + 2 children up to 15 years of age in the same room pay 3 full rates. - Until 09.06 and from 02.09 onwards, for a minimum stay of 6 days, we offer you one more day. - Special discounts for children even if accompanied by one parent (excluding period from 08.08 to 23.08). - (*) The reductions for children are valid in full board or half board. For child reductions in room only or in bed and breakfast, please contact us. For the whole summer season family discounts! Family plan 2 + 2 = pay 3, with 2 children up to 15 years old. FREE children up to 4 years accompanied by 2 adults. We provide camping cot, bath pan, high chair and meals. For a personalized quote please contact us! Until 8 June and 25 August onwards, FREE umbrella hire 2 loungers. Throughout the season 10% discount on all Beach Services (tents, umbrellas, sun beds, etc.). The Hotel Mercedes is in agreement with the brand new Zone nr. 116 and 117, featuring a swimming pool and whirlpool, and offer free amenities, including Animation and Kids Games. Up to 8 June inclusive and from 1 September onwards, for a minimum stay of 7 days, the Hotel Mercedes will give you an extra day completely free in any type of treatment and choose the beach umbrella at no charge, by renting 2 sunbeds.